Annabella Drummond was married to Robert III, King of Scots. They had the longest duration of a Scottish royal marriage in history. It lasted for thirty-five years and seven months. Annabella was born c. 1350. Her father was Sir John Drummond of Stobhall, near Perth. He was the eleventh Thane of Lennox and Chief of Clan Drummond. Her mother was named Mary Montifex. Sir John’s sister was Margaret Drummond (also known as Logie by her first marriage). Margaret was the second wife of David II, King of Scots. We know little of Annabella’s early life or education. When Annabella was about seventeen, King David chose her as the bride of the thirty-year old John Stewart of Kyle who was in line to inherit the throne if King David died childless. The marriage was a gesture of recognition of John Stewart as heir to the throne. As a consequence of this marriage, John Stewart received the earldom of Atholl from this father in May of 1367 and a grant of the old earldom of Carrick which was adjacent to Kyle from the king himself in June of 1368. When King David annulled his marriage to Margaret Drummond, John’s position was threatened. In addition, John and the Stewart family were in opposition to the king taking a new wife. John suffered interference in his lands from the king and may have been put in jail. How Annabella felt about all these troubles, we will never know. King David died in 1371. John’s father became King Robert II upon David’s death. John was named heir to the throne by parliamentary act in 1371. 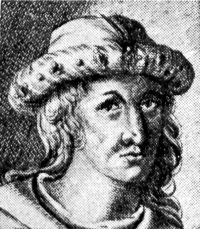 In the 1370’s John became a leading prince of the blood south of the Forth-Clyde line. He was in charge of maintaining peace on the English border and keeper of Edinburgh Castle. His ambition put him in conflict with his father and his brothers. Annabella was absorbed in the family power struggle from the early years of her marriage, especially with John’s brother the Earl of Fife. Fife had designs on the throne. In 1373, Annabella and John had only two daughters and no sons. Fife pushed through legislation saying all heirs to the throne must be male. It was a blatant effort to go around John and his daughters and put himself in direct line to the throne. Finally on October 24, 1378, Annabella gave birth to a son named David after the former king. Annabella gave birth to two more daughters and a son Robert who died in infancy. In 1388, John would suffer a terrible accident with a horse where he was possibly kicked. His health was never the same after this. King Robert II died on April 19, 1390 and John Stewart of Kyle, Earl of Carrick became King, changing his name to Robert. Robert was crowned on August 14, 1390 at Scone Abbey and Annabella was crowned the next day. A great crowd gathered to witness the coronation and for the festivities afterward. In March of 1391, Annabella was granted a pension of 2, 500 merks by parliament for her to adorn her person and for her household maintenance. On July 25, 1394, when Annabella was probably in her forties, she gave birth to her last child, a son named James. Sometime in the summer of 1394, Annabella received a letter from Richard II of England most likely inquiring about a marriage for one of her daughters. Richard’s letter no longer exists but Annabella’s response does. It is dated August 1 and it is in Norman French. She most likely dictated it to her secretary as it is not written in her hand or signed by her. She expresses her pleasure at the possibility of a match for one of her daughters. She mentions her reason for the delay in responding was due to her pregnancy. None of her daughters married anyone from England. Annabella began to actively promote the interests of her eldest son David. By the time he was fourteen, he had a functional part in government. She planned a huge tournament in 1398 that was held in Edinburgh during which David was knighted. On January 27, 1399, Annabella and Robert were at Scone when David was made Duke of Rothesay and named “Lieutenant of the Realm”. On the same day, Robert’s brother the Earl of Fife was made Duke of Albany. Not long after this, Annabella had to make a complaint that Albany’s deputies were withholding her revenues and Albany was ordered to remedy the situation. By this time King Robert was incapable of any control in his kingdom. There was corruption and bribery throughout Scotland and civil war between the Highlands and the Lowlands. David was debauched, self-indulgent and erratic in his behavior. He still needed full council approval to do anything and the Duke of Albany was once again in control. Robert’s health had deteriorated even further and he was in a deep depression. Annabella asked him how he would like his epitaph to read. He stated his desire not to have a proud tomb but to be buried in a “midden”, meaning a rubbish heap. He wanted his epitaph to read “Here lies the worst of kings and the most miserable of men”. Due to Robert’s ill health and the ineffectiveness of David, King Henry IV of England decided to invade Scotland in August 1400. He managed to besiege David in Edinburgh Castle but ran out of money and supplies and returned to England doing relatively little damage. Annabella died in the autumn of 1401 at Scone and was buried at Dunfermline. The chroniclers spoke well of her and praised her conduct as Queen. Shortly after Annabella’s death, Albany seized David, Duke of Rothesay and imprisoned him. He was to die under mysterious circumstances. King Robert feared for the life of his young son James. Robert died in April of 1406 after spiriting away James on a ship headed to France. The ship was seized by pirates and the new King James I was taken to England where he became a prisoner of King Henry IV.